Serial Scoop: EXCLUSIVE: Greg Vaughan on His 'Days of our Lives' Exit - "It's Going To Really Rip Your Heart Out"
Serial Scoop recently spoke with actor Greg Vaughan about his role in The Christmas Note, a holiday film that premiered on Hallmark Movies & Mysteries on November 29. Shortly after the subject of his role on NBC soap opera Day of our Lives came up, Vaughan revealed he was no longer a member of the cast, and will last air as Eric Brady in mid-April. In the exclusive Serial Scoop interview below, Vaughan shares details about his exit from Days, what's ahead for Eric, and what his final days on the set were like. SERIAL SCOOP: What is your current status at Days? GREG VAUGHAN: Well, the truth of the matter is, I'm not filming. I’ve actually wrapped up my storyline, and I'm no longer contractually on the show anymore. But the story is creatively going somewhere spectacular in my opinion. All the pieces start slowly coming together, making a great storyline and show. I feel very comfortable with stating that my character Eric’s journey isn't over. It just takes a direction that I think is going to be good for the character, and the show. Like all dramas. For instance, some of my favorites are The Sopranos, 24, or even Dexter. Someone unimaginable has to die to keep us as the audience tuned in for more. I’m not saying Eric is or isn’t going to die, but he will go down a path taking him off the canvas. Because of his downward spiral affecting many, many other characters, and intersecting stories within Salem, I think it is great storytelling. Eric’s been an integral character and an important part of the show, and this is something that I think is a surprise to Eric’s character, and the viewers which they will not see coming. Where Eric once was, and what people are starting to see coming on air right now, is inevitable. He’s got a bit of a drinking problem. It was collectively agreed upon that this was in the best interest of the show and for the character. Sometimes there has to be a sacrificial lamb, and my name was drawn. So, instead of taking it on a personal level, I looked at it as an actor. What I saw was [Eric] as the most unpredictable pick of the characters on the canvas, making it somewhat the right choice, and an opportunity to go out in style. Now, as an actor, what I want and where I could only hope it was going to go, is always a waiting game until the scripts get circulated. As the scripts trickled down from the writers, I put my thoughts on the table, and I knew if they put together what it sounded like, I could not only tap into it, but I was personally going to take it somewhere further than I think they even expected. Overall, I am very happy, and I am looking forward to it unfold. SERIAL SCOOP: Your fans are going to be very upset. GREG VAUGHAN: [Pause…] Words can’t express enough my gratitude of love I have for every individual I’ve embraced along my career. Yes, they will be upset for obvious reasons, and I know that this news comes as a surprise. But, not just my fans, all our viewers are the greatest voice I think, so let their voices be heard. I’m only one of many who creatively come together to make this show (Days of our Lives) successful, and hopefully [the network will] keep it on the air for many years to come. Our viewers are why it’s still running. With that being said, there have been a lot of tough decisions made, executive decisions that come with the job. If you're appointed to wear a big level hat in this industry, you have to make hard executive decisions. But, if you look at the [Nielsen ratings] numbers that are up, it's good, and the choices must be working. I was excited to be apart of the 50 year celebration, and I am excited to see the show's continued success. SERIAL SCOOP: I have been a big supporter of the new [behind the scenes] regime and have understood every decision that has been made. I don't agree with this one. October Days of our Lives book signing in Dallas. SERIAL SCOOP: What is coming up for Eric? GREG VAUGHAN: Alcohol is a serious addiction, and a dangerous path for many who battle this disease, but it’s something I learned a lot more about before going down this road with Eric. He is tragically becoming a lost soul. Someone who has professed so much faith is now drifting away to this self-medicating by way of alcohol, which is hard on so many levels. I can see people calling Eric a hypocrite, contradicting everything he has professed as a former priest. And that's not something that I wanted to bring light to, but we're all human and I think that because of his convictions and feelings of huge responsibility, depression kicks in and starts the drinking in motion. The burden of guilt, disappointment, lies, etc… all begin to factor in because of Eric's ignorance. He's going to have so much weight on him that is so overwhelming that he's going to be in complete turmoil. Only pushing him further down into the bottle, he will lose sight of who he is as a person, and his direction in life. It's going to be big. I’m excited just talking about it. SERIAL SCOOP: How did you react when you were first told of this story point? GREG VAUGHAN: Well, the story point didn't come into play until after I was informed that they wanted to take Eric off the canvas. SERIAL SCOOP: You have known for awhile? GREG VAUGHAN: I've known for quite awhile. [Days] talked to me about my contract a month or two before the time of my contract renewal, simply to inform me that I would not be contractually extended in the terms of years, but would be extended in order to take Eric off the canvas due to story content ahead. SERIAL SCOOP: Have you worked with anyone new that you hadn’t worked with before? GREG VAUGHAN: Well, I wouldn’t say that, but my last show which airs I want to say mid April, includes Martha [Madison, plays Belle Black], whom I hadn't worked with a lot since she returned. But it also includes Josh Taylor [Eric's father, Roman] and Deidre Hall [Eric's mother, Marlena], Drake Hogestyn [John Black] and Melissa Reeves [Jennifer Horton]. It's going to be great. It's the best work that I've collectively done, or been a part of since joining Days. My last scene that you will see, we did it in one take and I think it's like seven-minutes long! [Laughs] It's going to really rip your heart out, in so many ways. The irony of this is, that during the last two weeks, I was told my performances had been really good, as you never know until you see the air show. But I felt it had been my best work to date since coming on board, and soon after crossed paths with Mr. [Ken] Corday [executive producer], who reiterated, I’d been doing some fantastic work. So, if there was ever a time to wonder if your boss even noticed, I guess it answered my question. SERIAL SCOOP: Anything else fans can expect to see from Eric? 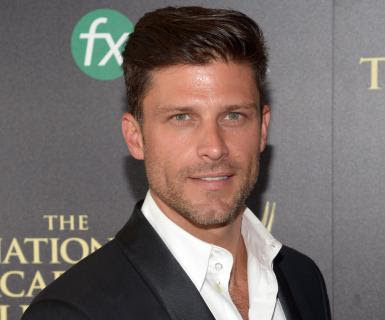 GREG VAUGHAN: Eric has been over the last couple months living his life in slow motion, then there is going to be a big gathering, where it's going to hit the fan in a big way. So, it's heating up, then people begin to push his buttons a bit and then it's going to be like, "You’re crossing the line," and on, like Donkey Kong. Brady, Nicole, Daniel, Eric’s family, everybody but the whole kitchen sink starts slowly questioning him, smelling something, something on his breath. Of course Eric will play it off like no one has seen it, done it, nobody is catching on. I don't even think Eric has even reached a point at this time where he even recognizes himself that he has developed a bit of a drinking habit. He has never been that addictive type of personality. It has never been in his character. SERIAL SCOOP: What would you like to share with your fans? GREG VAUGHAN: I have an amazing love and respect for everybody on my show, my cast and the crew. But my fans are and have been with me for years. They have followed my career, some of them for many years, and I am so humbled and incredibly blessed. SERIAL SCOOP: Anything else you would like to share? GREG VAUGHAN: I’d like to think the right people are currently creatively making executive decisions for the show. It is on a big turn for the better. Everyone gives their heart and soul day in, and day out, and I have big love for the show, the fans who stand by Days and their stories. Eric's not gone. He's off the canvas, but that doesn’t mean you're never going to see him again. It’s Days of our Lives. And it's never over in Salem.